That real estate offers by far the greatest number of money-saving tax gems, more than any other vehicle! That you can legally pay little or no taxes even with a large amount of income!! But most CPA’s cannot help you; they know little about the incredible strategies that empower you to put a lot more cash in your pocket !!! tax-saving secrets in the country! > Use the right entities that save you the most taxes; is audited least by IRS; best protects you from lawsuits, with the least cost & complexity. Save thousands! BEWARE of Nevada rip-off’s!! <span >“Al, your component depreciation method saved me almost $20,000 dollars in income taxes that year. It helped me financially having four girls in College at the same time.” …Angelo D. Guerra, Broker/Owner, ERA Platinum Realtors, Conshohocken, PA.
“Al, what I great feeling to get a $190,000 rehab credit. It was like the government writing me a check for $190,000! Thank you so much”…Bob Diamond, Attorney and National Speaker, Phila. PA.
> How not to waste deductions. With these techniques is that you “bank” your deductions for future years (when needed), instead of losing them forever! >How to never pay taxes when you sell property, even if profits are huge! > Totally AVOID being a Dealer and prevent 50+% of your resale profits from being drained by all kinds of taxes. 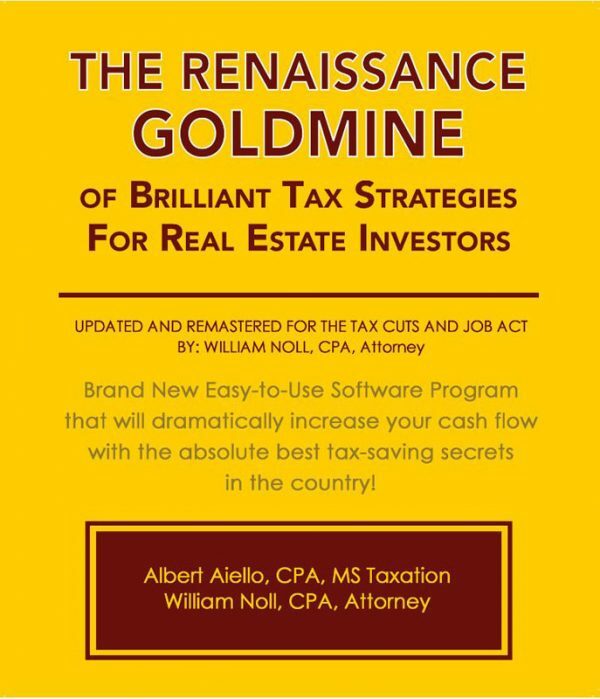 Like NO other resource, the Renaissance Goldmine contains over 30 proven strategies (including a little-known Supreme Court Case) to eliminate the costly impact of being a dealer, even with a large amount of flips. Also – how to undue being a dealer. These strategies alone can cut your taxes by 50% or more! > Avoid Depreciation Recapture even with large depreciation deductions, continue to bank thousands! > Use the powerful 1031 Tax-Free Exchange to zero out taxes on the sale of properties and accumulate wealth; including using 1031’s for quick flips (you legally can, if you know the tax law with planning). > Seller Financing Tax-Saving Strategies…Save $1,000’s both as a buyer or seller! > How to buy and sell Straight Options TAX-FREE, avoid any IRS traps, and you keep 100% of the profits! > The incredible Self-Directed IRA for totally tax-free real estate transactions, including how to take out tax-free and penalty free cash out of an IRA. Avoid costly self-dealing penalties. < > “Al, because of your Goldmine we got an unexpected refund of $14,000 from deductions that we used to offset against our W-2 income and took us out of AMT. For next year we can drastically cut our withholding and increase our cash flow by about a $1,000.00 a month. Thanks” …Bob O’Brien, RPO Properties, LLC, Austin, Tx. > 30+ Dynamic Year-End Strategies before December 31 for the current year (even at the 11th hour), most CPA’s never even think of recommending. > MUCH MORE…to save you money! Forms To Substantially Maximize Depreciation Deductions Via Cost Segregation Analysis – Double and triple your depreciation deductions without laying out cash and save $1,000’s every year! Also Save $1,000’s in Consulting Fees! With these forms you do NOT need to hire a cost segregation consultant who would charge $5,000 to $10,000 or more and still not be as thorough as AL’s system! Will save you taxes, penalties, interest, legal fees, plus the time and aggravation of an audit. Forms To Avoid Being A Dealer – Save tens of thousands! Forms For Other Tax-Saving Strategies. For ease-of-use, there are both blank and sample filled-in formats with step-by-step instructions. These forms are NOT available anywhere else… including tax preparation software programs. Nowhere… but here! With Al, you will be cracking up (while you are saving a bundle)! VIP BENEFIT:Email Q&A Access Directly to AL for Your RE Tax Questions – responded by Al with prompt expert results – save $1,000’s not just in taxes, but also legal & accounting fees! Access For Your Tax Advisor’s Use On Your BehalfYou can share Al’s program with your advisors including the email Q&A access to Al (Under a Special Licensing Agreement). You also get to test their competency. Constant Course Update With No Upgrading Necessary –Your Lifetime Real Estate Tax-Reduction Library– Yes, you will always be updated under this program with no need to upgrade to a new edition. Ed Carter, Investor, Atlanta, GA.
Review is by a top CPA/Tax Specialist under the supervision of AL. Takes several hours. Quick & easy. Based on a quicker & easier Action Plan method as opposed to a cumbersome, time-consuming text-book approach. Master Action Plans (MAP’s). You put the CD-Rom software in your computer and where indicated click to the MAP or MAP’s (from 1 to 40) that interest you and this will take you to the particular MAP which is a quick 30 second overview of the particular tax topic, to save you time. Specific Action Plans (SAP’s). If you want more info, from the MAP click to the Specific Action Plan (SAP) of the same tax-saving topic. The SAP’s further expand on the MAP’s with step-by-step, to-the-point strategies including supporting tax law cites for every Renaissance Goldmine strategy and the correct IRS forms required for a particular strategy (for you or your CPA. Wrong forms cause IRS problems!). On-Line Text. If you (or your CPA) want even more in-depth coverage of the particular topic, from the SAP you click to the Renaissance Goldmine on-line text which is a back up reference when and if needed, containing 89 Chapters with 825 pages of exhaustive research of 1000’s of hours, all done for you, which you can share with your CPA. It is for reference only; it is not a cover-to-cover read. 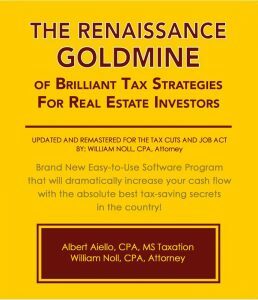 Still a real investor, today Al is considered by many guru’s to be the number 1 speaker/expert on tax-saving strategies for real estate investors. With his home study systems, he has thousands of satisfied students across the country who use his powerful strategies to pay little or taxes, to IRS audit-proof their returns and to protect their assets. Al is also known to have high integrity; is professional, congenial and well-liked by his students and many others. “Al Aiello is a consummate professional who KNOWS HIS STUFF!!!! “AL Aiello is the best at 1031 exchanges”…. Dennis Cohen, Esquire, Head of Tax Department, Cozen & O’Connor,national law firm, Phila. PA.
Hello! My name is Natasha. Like you I’m a real estate investor and have been for the last several years. Let me tell you, it has been a rickety misadventure of unnecessarily overpaying taxes, inept CPA’s and the infamous IRS. So many beginners in flipping properties are given wrong advice like I got – being told to use a corporation and that I was a dealer. I ended up getting SOCKED with the highest amount of taxes, like $9,000 on my first deal! OUCH!! If I had I known then, I could have avoided being a dealer and used my self-directed Roth IRA to pay NO taxes (ever) on the profit. That would have been so…nice! Because I was ill advised, I unnecessarily used more audit prone IRS forms. (I know this because the IRS agent, herself, said they were). It cost me a total of $3,000 plus my valuable TIME and oh..the AGGRAVATION! I later learned through AL there are ways to audit proof your tax return where this nightmare could have been avoided. When my income exceeded $150,000 that one year, the accountant told me I could not take my property losses against my business income; they had to be carried forward until something happened in the future? The accountant (like most) simply did not know the legal techniques of how investors (even with full time jobs) can qualify as a “real estate professional” so we can claim these deductions against our other income with no limits. Not being able to deduct my property losses right way cost me over $7,000 in taxes. That hurt! I was hesitant to sell one of my properties because of the capital gain and recapture taxes of about $20,000. When I ask one of my former accountants about it, he said, “You are making a nice profit on the sale, just pay the taxes and get it over with”. It amazes me how such knuckleheads could easily tell you to pay for something you can legally avoid paying, and when it’s not their money!! Later I discovered, that a 1031 exchange could have avoided all taxes on the profit and saved me a lot of cash which I sure can use. Most CPA’s know little or nothing about 1031’s, despite being perfectly legal and saving investors a ton of money to the point where many become millionaires. Bad CPA’s Can Cause You To Go Broke! Successful real estate investors know they have to take money matters into their own hands. I know this because I learned the hard way having been through several accountants, costing me thousands of dollars in taxes, accounting & legal fees (for bad advice), all totaling over $40,000 all of which could have been avoided. If you allow your CPA to be in total charge of your money, you’re going to be broke! There Is A SOLUTION !!! 1. You can pay the IRS – Thousands.. every year!!! Your Investment In This Program Is Fully Tax Deductible! Al backs this with a Tax-Reduction Receipt For Payment which includes the tax law cites supporting the deduction, along with how & where to take the deduction on your tax return. With this deduction you start to save taxes, immediately! So how can you go wrong? Please order now at the special price of only $2495 $1695, before it goes up!